We want to thank everyone who attended our fundraiser this past Friday at Brew! Even with a sprinkle starting an hour before the scheduled ride, we still had about sixty riders willing to head off into that great known, brakes squealing and rain pouring. The right clothes made it just another ride in Northern Michigan....we're a remarkably hearty breed. With riders in their 60s down to two Norte heroes, we were also joined by Velo City Cycles owner and profession road racer Brad White and reigning US National Road Race Champion Larry Warbasse! We kept the big guys relaxed and enjoyed a soggy but very fun circuit behind the State Hospital. The trail held up very well, with riders testing their headlights and nerves on a few steep and perilous descents, but as far as we know, everyone made it out alive. Probably. 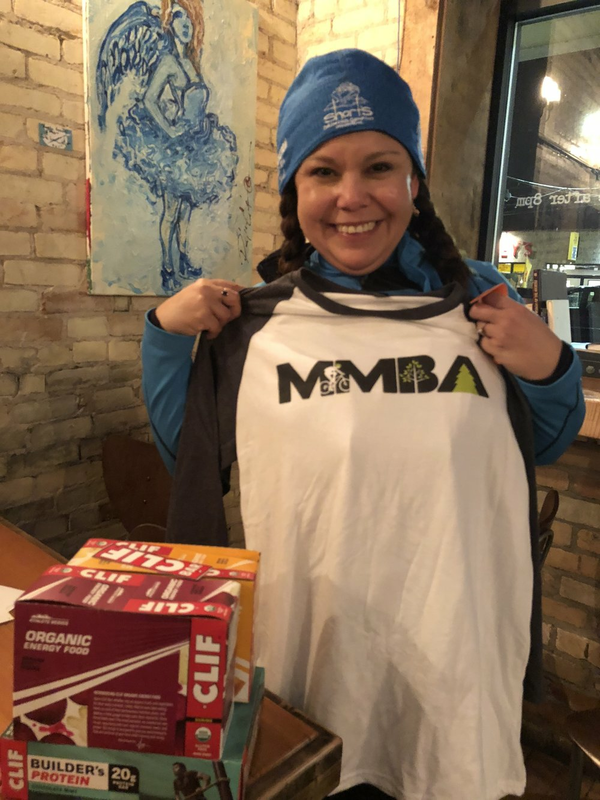 Back at Brew and out of the rain, Kim, Michele and the rest of the NMMBA crew smart enough to stay out of the weather had a wonderful display set up featuring grooming badge sales, raffle prizes, and information about the trails. Sean, Missy, and Erin from Brew had something even more important: Short's Brewing Company beer. It was flowing in copious amounts as our 60 or so riders were joined by over one hundred other local riders relaxing, catching up, and trying to recognize each other off the bike and out of the woods! And those raffle prizes went really well; M22, Glacial Hills, 45NRTH, Short's, and Clif Bar all donated bundles of sweet stuff to win for just a few bucks! We also heard from Tom White about the mission of the night, which as to allow NMMBA to make a donation to Michigan Mountain Bike Association. MMBA is our voice in Lansing, and we're proud of the Traverse City Cycling Community for recognizing how valuable it is to have a presence and voice in so many committees in the capital. The event was a perfect chance to get together and enjoy an evening together, and also gets us very excited for the winter riding season. With snow in the forecast a few days a week, it's only a matter of time before it sticks and we're out grooming some of the best winter singletrack in the world, right here in our backyard! Thank you for supporting our mission, for giving to a worthy cause, and for being wonderful company on a rainy night in Traverse City. We'll see you on the trails!